NextShould Raised Shoulders Be Considered Sidewalks? Sometime after the construction of MetroLink to Shrewsbury, an ADA issue cropped up at the intersection of Forest Park Pkwy & De Baliviere Ave: the curb ramps at the northwest and northeast corners were excessively steep. Last December, the Board of Public Service fixed the issue by installing sidewalk ramps parallel to the Parkway. The solution, however, is worse than the original problem as the new ramps are a pedestrian casualty waiting to happen. 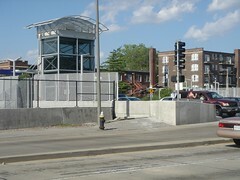 A concrete wall blocks the path of pedestrians wishing to access the Forest Park-De Baliviere MetroLink station. In my previous post, I wondered whether raised shoulders constituted a sidewalk. Immediately to the west of De Baliviere Ave, Forest Park Pkwy has a raised shoulder that extends almost to Skinker. 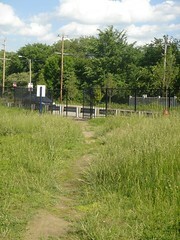 In this particular example, the residents of the 5700 block of Pershing use this shoulder as a sidewalk as a means of accessing the Forest Park–De Baliviere MetroLink station. The problem is that the new ramps block the sidewalk with a 5-ft concrete wall. The danger is that in order for pedestrians to get to the MetroLink station, they must walk around the newly built sidewalk ramps and in the traffic lanes of Forest Park Pkwy. Driving to work in the morning, I take the Parkway westbound and have, on occasion, seen pedestrians waiting on the far side of the sidewalk ramps waiting for a break in traffic. A worn path shows use by the residents of the 5700 block of Pershing. Pedestrians currently access the Parkway’s shoulder via a gate in the fence and a step over the guardrail. A well worn path in the grass indicates the demand for this route. This problem can easily be fixed by tearing down the new concrete wall that is blocking the sidewalk. The raised shoulder of Forest Park Pkwy should also be converted into a true sidewalk to better accommodate the pedestrians who use the path. As mentioned by commenter “coldlampin” in an I-64 Live discussion at STLtoday.com, there is a large step in an unusual location at the northwest corner of the intersection. The sidewalks approaching Forest Park Pkwy descend and then fall off about 8 inches with little warning. There is no buffer between that descent and the roadway, so if someone does not see the drop-off they are in fate’s hands straightaway. The current step exists so that the average pedestrian does not have to use the sidewalk ramp. The problem is that, due to the new ramp, a pedestrian may not notice the step due to its unusual 5-ft distance away from the curb. A trip and fall would put a pedestrian perilously in front of traffic on Forest Park Pkwy. It doesn’t help, either, that the sidewalk is steeply sloped leading down to the step. Install a tactile and colored warning surface at the top of the step. Install a fence blocking the way and forcing all pedestrians to use the sidewalk ramp. Note that the second idea still presents a danger if pedestrians, annoyed by the fence blocking the straight path, go around the fence by walking in the traffic lanes of southbound Debaliviere. Tunnel excavation west of De Baliviere Ave, May 2004. // Cross County MetroLink. The most aggravating thing about the existing sidewalk danger is that it is a new issue with multiple agencies at fault. 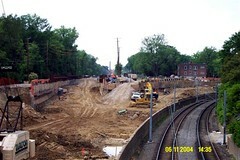 On the right is a picture of MetroLink construction just west of De Baliviere Ave. As is clearly evident in the photo from May 2004, the entire parkway was ripped out to build a tunnel for MetroLink. Reconstruction of Forest Park Pkwy evidently involved rebuilding the roadway as it was with little to no improvements whatsoever. No thought was given to accommodating pedestrians, at all. The failure to consider the needs of pedestrians walking along the parkway extended to the parkway’s intersection with De Baliviere Ave. The roadway was not reconstructed at a higher elevation to meet the sidewalks of the rebuilt MetroLink station. As a result, curb ramps were built at ridiculously steep inclines. The St. Louis Board of Public Service, did not inherit an easy problem to fix. While they fixed the problem they were tackling, they created another when they overlooked the fact that pedestrians were using the parkway to travel to and from the neighborhood to the west. Major pedestrian safety issues exist at the intersection of Forest Park Pkwy and De Baliviere Ave. The problems appear to stem from the failure by Metro and the City of St. Louis to raise Forest Park Pkwy to the same elevation as the De Baliviere Ave bridge during MetroLink construction. However, it is still possible to substantially mitigate the dangers. Let’s hope that the problems are fixed before any pedestrians are injured.